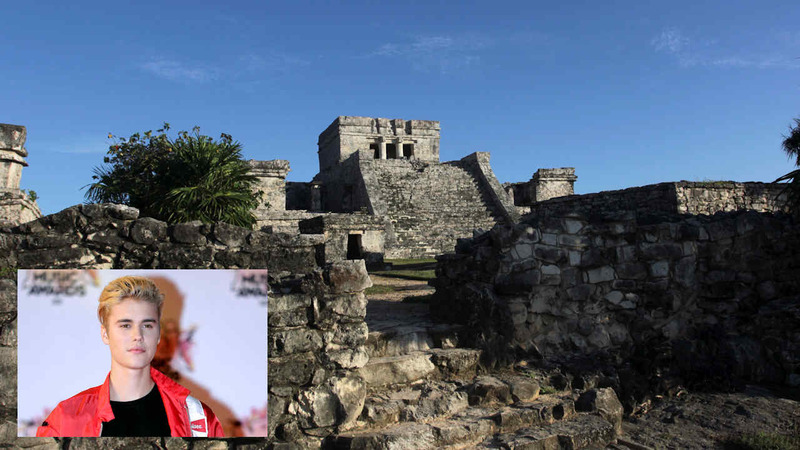 MEXICO CITY -- A Mexican official said Friday that Canadian pop star Justin Bieber and his entourage were asked to leave the Mayan archaeological site of Tulum after he apparently tried to climb onto or among the ruins. The official of the National Institute of Anthropology and History spoke on condition of anonymity because he or she was not authorized to be quoted by name. Bieber was visiting the seaside ruins on Thursday when the incident occurred. The official could not specify which of the site's structures Bieber allegedly had climbed, but said he was "asked to leave." Visitors can climb some pre-Hispanic pyramids in Mexico, but officials rope off or place 'no entry' signs on some ruins that are considered vulnerable or unstable. Bieber has apparently been on vacation in the Tulum area, on Mexico's Caribbean coast south of Cancun, for several days. Despite the singer's reputation for getting out of line, the representative of a native Maya ecotourism camp that Bieber visited near Tulum several days before described him as "completely respectful." Nathalie Leo, the spokeswoman for AllTournative, a cooperative effort with Maya communities at a camp called the Jungla Maya Park, said Bieber visited Jan. 5 and "expressed a lot of interest in the work we do to preserve the environment." "He was completely respectful, and he participated in the welcoming ceremony performed by a local shaman," said Leno. "He even ate some of the traditional food prepared by local communities," she noted. Bieber has been involved in several incidents in Latin America in recent years. In 2013, Mexican President Enrique Pena Nieto denied a tweet by Bieber saying the singer met with the leader and his family prior to a show. Apparently, Bieber was confused about whether the president was there or not. Bieber later wrote in a tweet, "correction. I met the presidente's family and all their friends in the private meet and greet with all their security. They were very nice." That same year, Bieber faced two criminal complaints and demands for refunds in Argentina, in addition to trouble with police for allegedly spraying graffiti in Brazil. Bieber angered Argentines by abandoning a concert after less than an hour and not showing up for a photo-op that some fans paid hundreds of dollars extra for. The singer's manager said Bieber came down with food poisoning after a concert. One Argentine lawyer accused Bieber of sending bodyguards to attack a photographer outside a Buenos Aires nightclub. Another accused him of defiling the national symbol by dragging two Argentine flags off stage with his feet and a microphone stand before 45,000 "beliebers" during the first of two concerts in River Plate stadium. Bieber also walked off the stage in Brazil, ending a concert early after someone threw a plastic bottle at him and Brazilian police tried unsuccessfully to question him about defacing a public building with graffiti, a crime that carries a year's prison sentence.